When it comes to outright protection in glove form, racing gloves are the way to go. But what if you don’t need all that jazz? 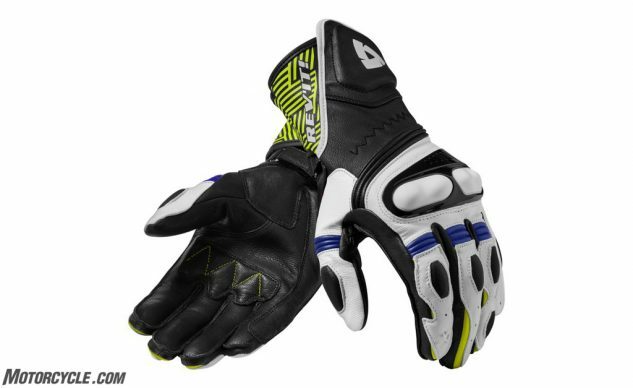 If you’re never going to visit the track (or maybe partake in a handful of track events a year), but still want something that’s full-length, fully featured, somewhat sporty, and three-season capable – there are other gauntlet gloves you can choose from. Best of all, these gloves are much more affordable than their full-race cousins. Truth be told, there are dozens upon dozens of gauntlet gloves to choose that can handle everything from sport riding to touring and everything in between. Here are just a select few, presented in alphabetical order. 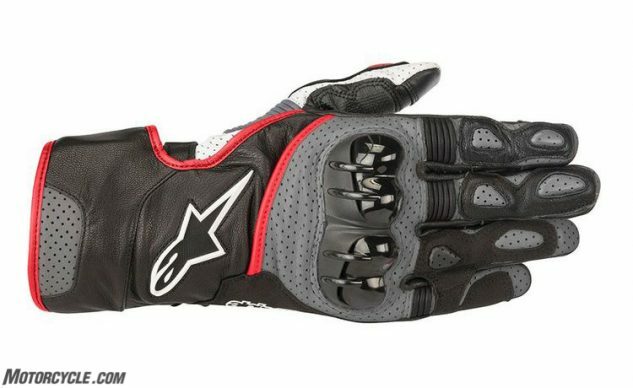 The second version of the SP2 glove (hence the V2), this is one of many do-a-little-bit-of-everything gloves from Alpinestars. 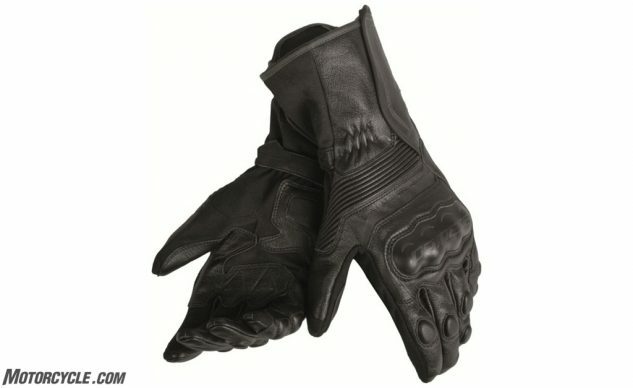 The general construction of the glove was modeled loosely around Alpinestars’ race gloves, as you can see by the TPU injected knuckle armor, but the SP2 is entirely cow leather. Accordion panels across the fingers and thumb provide greater flexibility compared to its predecessor, and lots of perforation from wrist to tip provide air flow. Dual wrist closures help keep the glove in place, and synthetic suede reinforcements are placed in key areas to resist abrasion. An underappreciated, and easily overlooked, addition is the small elastic panel between the thumb and first finger that provides a little more comfort. Lastly, the tips of the thumb and first finger are touchscreen compatible to operate your smart devices without the need to remove the gloves. 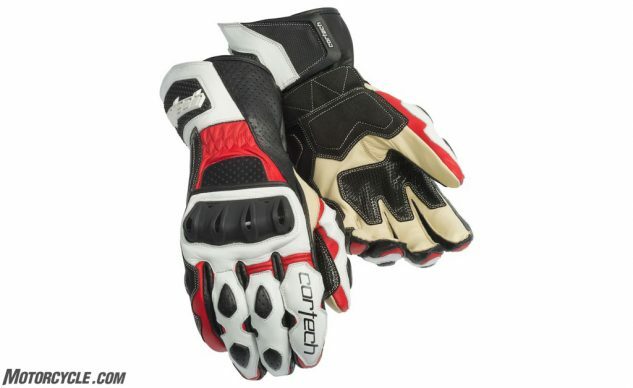 For 90 bucks, the Cortech Latigo RR 2 gloves are tied for the least expensive gloves on this list. But don’t confuse the price for being an underfeatured glove. The cow leather outer construction is doubled up on the fingers and palms for extra abrasion resistance. Rubberized padding is also used on the palms for another layer of protection. A TPU polyurethane knuckle is standard, while pre-curved palm and fingers help reduce fatigue. A large velcro wrist strap keeps things in place. Many would associate Dainese with racing, especially because of its ties with Valentino Rossi, but the brand clearly goes beyond the racetrack. The Assen glove is proof of that, despite sharing its name with the only racetrack that has been on the MotoGP calendar since the class was created in 1949. Built for the sport rider who may dabble in a trackday or two, the Assen is built with cow leather and features a polyurethane knuckle with padding underneath. Leather and elastic stretch panels allow the hand to move freely, while an extra layer of leather gives reinforcement for the palm. Pre-curved fingers add comfort, an adjustable cuff strap keeps things secure, and strategically placed soft inserts add comfort and protection. 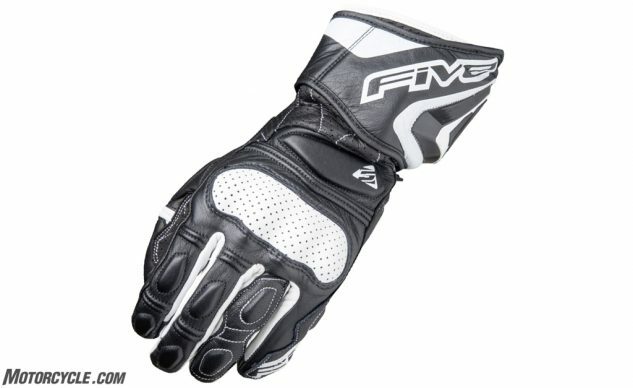 The RFX3 glove from Five takes heavy inspiration from its more race-oriented cousin with its goatskin construction providing suppleness, and TPR injection molding on the wrist and palm slider providing high levels of protection for those delicate areas. Of course there’s hard knuckle armor (wrapped in perforated leather), accordion panels across the fingers and thumb for flexibility, and dual wrist closures to keep everything in place. 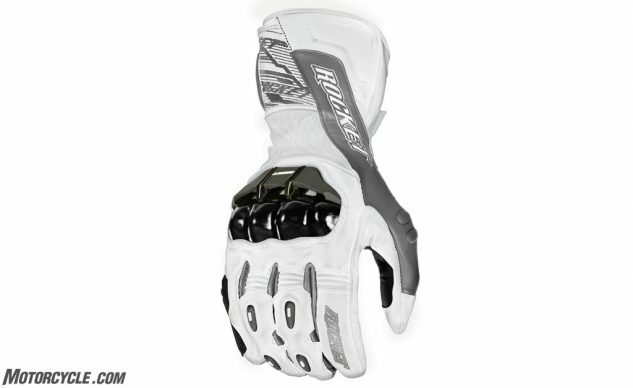 The RFX3 has a lot of the same features as a true race glove but at a much more agreeable price. Subscribing to the K.I.S.S. mentality – Keep It Simple Stupid – the Buffalo Pro gloves from Helimot are unlike anything else on this list. In case you haven’t heard of Helimot, riders up and down the San Francisco bay area and Pacific Northwest will tell you Helimot is the best-kept secret in motorcycle protection. That’s because Helimot blends comfort and safety differently than the big names, and makes everything right here in the USA. Constructed from deerskin, the Buffalo pro is liner-less, but features a squeegee on the finger (you don’t know how useful this is until you try it) and reflective taping on the fingers for better visibility. The velcro retaining strap goes over the wrist unlike most other gloves that place it under, in a more vulnerable area, the fingers are pre-curved, and knuckle protection is via thick memory foam, not injection molded armor. Company founder Helmut Kluckner is committed to both comfort and safety and will help tailor the glove to the customer or help with repairs in the event of a crash (repairs, he claims, are largely superficial most the time). Helimot customers drink the cool-aid, but because the product works and lasts a long time. The Flexium TX glove is a no-nonsense gauntlet glove for the rider on a budget. Genuine cowhide leather is topped with double stitching throughout, and extra layers of leather are integrated into the palm and side to help resist abrasion in a crash. 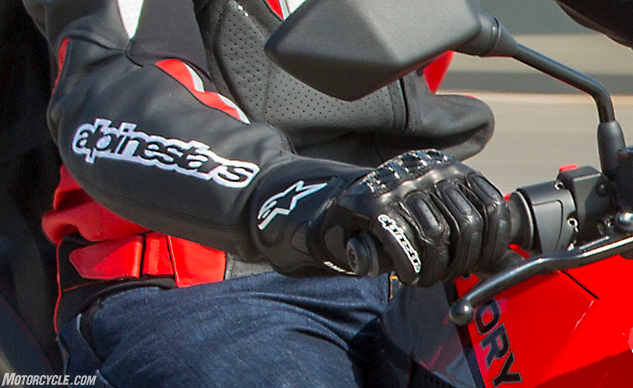 Injection molded knuckle armor features air vents for a little circulation while riding. Accordion panels across the fingers and thumb provide good flexibility, while a large velcro cuff is supported by a secondary wrist strap to keep the glove securely in place. For sport-touring riders who are committed to riding twisty roads no matter the weather, the Racer MultiTop 2 Waterproof gloves should be right up their alley. On the surface, the MultiTop 2 has similar features to the other gloves on this list – leather outer with kangaroo palms, carbon fiber knuckle and finger armor, padded palm protectors with a kevlar underlining, plus extra grip material along the hand for better feel at the controls. What sets this glove apart is the waterproof/breathable lining, which provides a layer against wind and cold that the other gloves here don’t. This could be the difference between a three-season or four-season glove depending on your cold tolerance. Rev’It has the style game down, and the Metis is just another example. Derived from the company’s equally stylish race gloves, the Metis features goatskin construction for instant comfort and feel while still providing excellent abrasion resistance. TPU knuckle armor takes the hit should you fall, and Temperfoam underneath reduces the amount of impact energy reaching your hand. Little foam protectors can be found above the fingers, and generous use of accordion paneling across the fingers and metatarsals allow the hand to move freely. For a glove barely tipping over the $100 barrier, the GP-WRX glove by RS Taichi is a very solid choice. 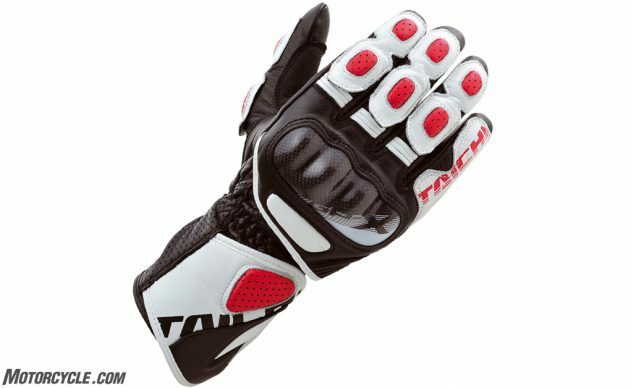 Billed as RS Taichi’s entry level sport/street glove, the GP-X is a full-length gauntlet design with full leather outer construction and a polyester lining inside. It’s got all the features you’d expect in an entry-level glove, too: carbon knuckle protection, velcro closures, and flex paneling on the first three fingers for better range of movement. The “floating” knuckle armor allows the hand to move more freely, and strategic use of foam padding helps mitigate injuries in a fall. 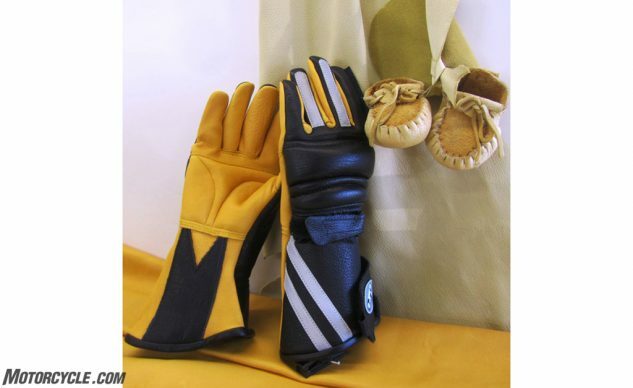 But what impressed us about the gloves when we reviewed them was how comfortable they were, instantly. 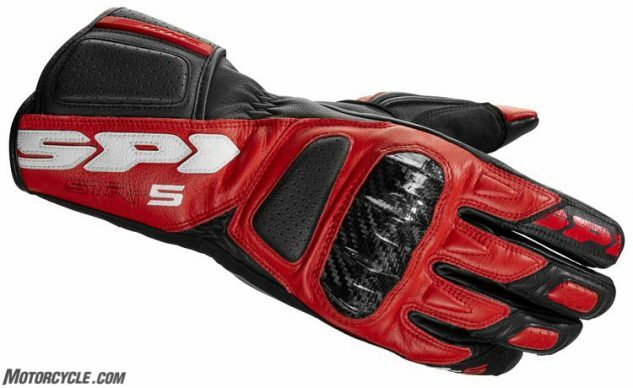 Arriving near the end of the alphabet, the Spidi STR-5 gloves draw their inspiration from the track, but are suitable for a wide range of street-focused riding. Constructed from 0.6mm – 0.8mm goat leather combined with high-resistance suede microfiber in reinforcement areas, the STR-5 promise great comfort combined with positive feel at the controls. 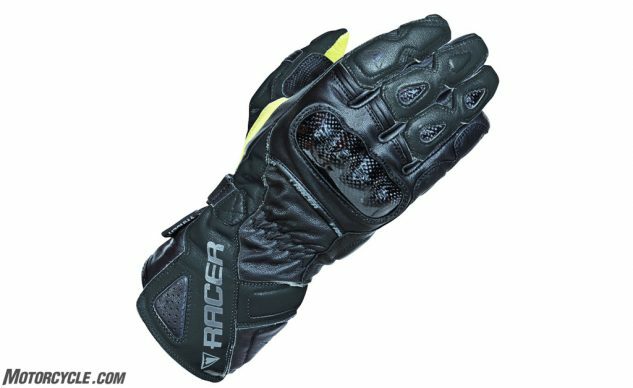 Generous use of padding along the side and back of the hand keeps much of the impact energy away from your hand in a fall, and carbon knuckle protection is par for the course for gloves at this level. A large foam pad on the palms, again reinforced with suede microfiber, helps protect the key area that’s often the first part of the hand to touch the ground in a crash. Dual wrist closures ensure the glove stays put.